A collection of concise verses spoken by the immortal sage Narada on bhakti, our essential relationship with the Supreme Self, Krishna. Renunciation also means being exclusively dedicated to the Lord and indifferent to what stands in the way of His service. Pure devotees are so exclusive in their intent to serve the Supreme Lord without any reward that they do not accept any kind of liberation, even though it may be offered by the Supreme Lord. This is confirmed in the Srimad-Bhagavatam (3.29.13). One kind of mixed devotional service is known as jnana-mishra-bhakti, or devotional service mixed with empiric knowledge. Srila Prabhupada writes, “People in general, who are under the influence of avidya-shakti, or maya, have neither knowledge nor devotion. But when a person who is a little advanced and is therefore called a jnani advances even more, he is in the category of a jnana-mishra-bhakta, or a devotee whose love is mixed with empiric knowledge” (Bhag. 4.9.16, purport). Narada’s definition of bhakti, being “exclusively dedicated to the Lord,” refers to pure devotional service in the liberated stage. This has also been noted by Srila Prabhupada in his commentary on the first sutra of the Narada-bhakti-sutra, wherein he says that pure devotional service begins after the brahma-bhuta [Bhag. 4.30.20], or liberated, stage. A pure devotee is akama, free of material desire. He is conscious of his actual position and derives satisfaction only from serving the Supreme Lord. Srila Prabhupada writes, “Srila Jiva Goswami has explained this desirelessness as bhajaniya-parama-purusha-sukha-matra-sva-sukhatvam in his Sandarbhas. This means that one should feel happy only by experiencing the happiness of the Supreme Lord” (Bhag. 2.3.10, purport). “O Lord of the universe, soul of the universe, O personality of the form of the universe, please, therefore, sever my tie of affection for my kinsmen, the Pandavas and the Vrishnis. O Lord of Madhu, as the Ganges forever flows to the sea without hindrance, let my attraction be constantly drawn unto You without being diverted to anyone else” (Bhag. 1.8.41-42). The basic principle of the living condition is that we have a general propensity to love someone. No one can live without loving someone else.… The missing point, however, is where to repose our love so that everyone can become happy.… The Nectar of Devotion teaches us the science of loving every one of the living entities perfectly by the easy method of loving Krishna. We have failed to create peace and harmony in human society, even by such great attempts as the United Nations, because we do not know the right method. p>In 1967, His Divine Grace A.C. Bhaktivedanta Swami Prabhupada translated and wrote purports for thirteen of the eighty-four aphorisms (Srila Prabhupada called them “codes”) of the Narada-bhakti-sutra. In 1989, at their annual meeting, the Governing Body Commission of the International Society for Krishna Consciousness (ISKCON) suggested that I complete the book. I was pleased to accept the assignment, especially because of my involvement with Srila Prabhupada’s initial writing of the Narada-bhakti-sutra. I was part of the small group of seekers who joined Srila Prabhupada in the latter part of 1966 at his storefront temple at 26 Second Avenue, in New York City. At one point we began passing around a Gita Press edition of Narada’s Philosophy of Love—Narada-bhakti-sutra. Some of us were attracted to the nectar and simplicity of the aphorisms. In those days it wasn’t unusual for us naive followers to pick up all sorts of translations of Sanskrit Indian books. We tended to think that anything Hindu was salutary and within Krishna consciousness. It wasn’t long before Srila Prabhupada made it clear to us that we had to discriminate. Many books, we learned, were the works of Mayavadis, a brand of atheists in the guise of swamis, gurus, and scholars. It was hard to break our attachments to some of these books, but we always did so once Srila Prabhupada explained that a particular book or guru was not bona fide. But when I showed Srila Prabhupada the Narada-bhakti-sutra and told him I liked it, he encouraged me and said he might translate it. In our edition of the Narada-bhakti-sutra was a beautiful color illustration of Sri Sri Radha and Krishna. They looked young, about eight years old, and stood gracefully by the edge of the Yamuna River with a cow behind Them. I took the illustration to a photography shop and had a dozen color copies made. With Srila Prabhupada’s approval, I gave a photo to each of his initiated disciples. It became like an ISKCON membership photo and was used by devotees on their personal altars. It was significant that Srila Prabhupada began his first purport with a reference to Bhagavad-gita, the foremost scripture for teaching bhakti-yoga. The Narada-bhakti-sutra, or any other treatise on devotion to God, should be supported by Lord Krishna’s direct teachings in Bhagavad-gita. By their nature, sutras require explanation. As Lord Chaitanya explained while discussing the Vedanta-sutra, the aphorisms have a direct meaning, but their brevity allows devious commentators to distort the meaning through misinterpretation. How safe we were when reading the Bhaktivedanta purports to the Narada-bhakti-sutra, and how dangerous it is to read these aphorisms when interpreted by those who lack pure devotion to the Supreme Person! As with his other works, Srila Prabhupada’s purports to the Narada-bhakti-sutra were completely in line with the teachings of the parampara, or disciplic succession, and at the same time full of his own realizations. One particular statement that attracted me was his reference to enthusiasm in bhakti. Commenting on Sutra 5, Srila Prabhupada compared enthusiasm to a powerful engine that has to be used properly. He wrote, “If one, however, becomes disappointed in his enthusiasm for serving the Supreme Lord, that disappointment must also be rejected.” As a neophyte devotee, I was well aware of the danger of depression, which we sometimes refer to in ISKCON as being “fried.” But just as a serious practitioner restrains his tongue and other senses, so one should not indulge in too much depression or disappointment. It was comforting to hear this from Srila Prabhupada and to gain conviction that it is within our control—we are not helpless before unlimited waves of depression. “Please accept my blessings. I have seen the typed copies of Narada Bhakti Sutras as well as Teachings of Lord Chaitanya. Both of them are nicely made. I think let us finish first Teachings of Lord Chaitanya and then we may take again Narada Bhakti Sutras. The subject matter discussed with Narada Sutras is already there in the Teachings of Lord Chaitanya. And so Srila Prabhupada’s work on the Narada-bhakti-sutra stopped, and it was never resumed. It was a personal choice by the author, who wanted to concentrate on Teachings of Lord Chaitanya. But we should not see it as a rejection of the Narada-bhakti-sutra. Srila Prabhupada intended to “take again Narada Bhakti Sutras.” And so more than twenty years later we are taking up the work again, on the authority of Srila Prabhupada. Whatever we have written to complete the work we have done as Srila Prabhupada’s student, using his commentated translations of the Srimad-Bhagavatam, the Bhagavad-gita, and the Chaitanya-charitamrita, and his summary studies of the Bhakti-rasamrita-sindhu (The Nectar of Devotion) and the Bhagavatam’s Tenth Canto (Krishna, the Supreme Personality of Godhead). The major importance of the present publication is that another of Srila Prabhupada’s literary works is now available in book form for his growing reading audience. The GBC’s request to Gopiparanadhana Prabhu and me to complete the Narada-bhakti-sutra is their mercy upon us. We pray that we have not deviated from Srila Prabhupada’s intentions and that this edition of the Narada-bhakti-sutra will bring pleasure and enlightenment to the hearts of everyone who reads it. Editor’s note: Citations from Krishna, the Supreme Personality of Godhead and Teachings of Lord Chaitanya are from “The Great Classics of India” editions (1985). 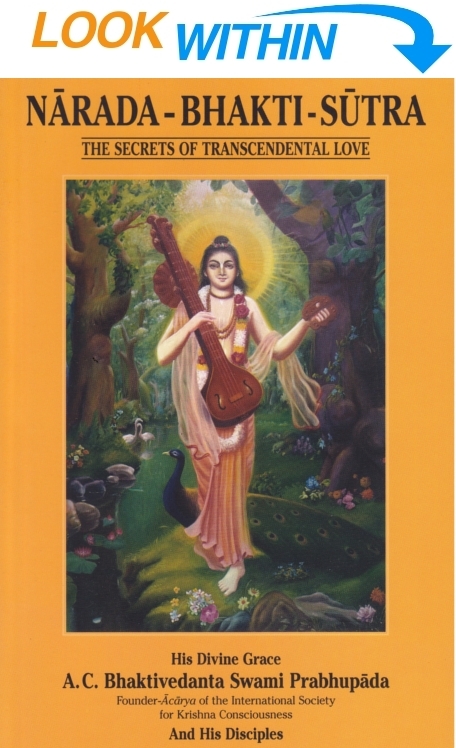 Citations from The Nectar of Devotion are from the 1982 edition.